Oh, hey style challenge (and Friday-holla!)! The oh-so-stylish ladies of Poshmark decided to show off how we are rockin' the super popular sneaker trend, and I just love seeing how everyone styled them. I've always been a fan of some cool and casual kicks, so I must admit that it wasn't a huge challenge but most definitely a fun one! Love what you see? 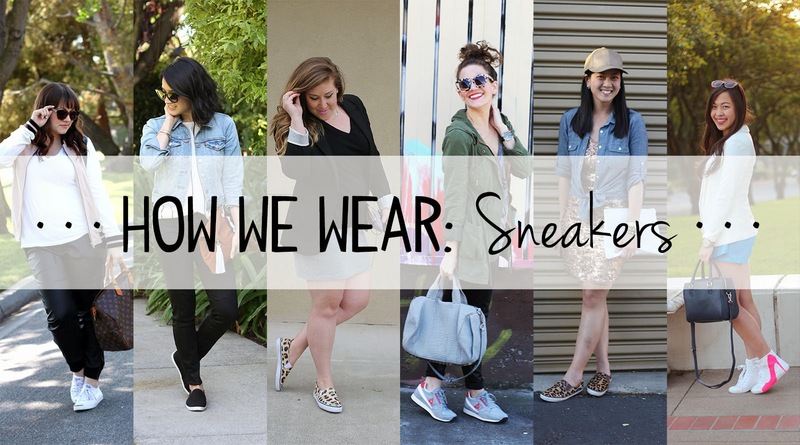 Join the conversation by using the hashtag #HowWeWear and linking up with us below! I NEED those leopard sneakers! I'm sure Goober would approve :D Loving the neutral palette with the sneakers as a wild pop! I miss your face!! You look beautiful! This dress was awesome and it definitely looked way more expensive than what I actually paid. I would recommend buying it even if you don't have an occasion yet. It's such a good value for the price! I love this as a business casual look!